What is the Cape Cod Canal Tunnel? The Cape Cod Canal Tunnel is a magnificent engineering feat that lightens all Cape Cod summer traffic anguish, torment and suffering. Have you ever said? It's not worth going over "the bridge" anymore? Or if you have ever driven over the Bourne Bridge and Sagamore Bridge during summer, you know it can have traffic back-ups to twenty miles long! 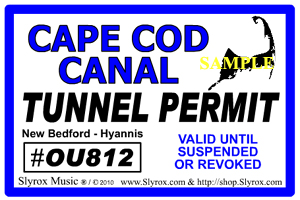 Now is your chance to purchase the Cape Cod Canal Tunnel Permit sticker decal to help alleviate the agony and ordeal of summer traffic. The Cape Cod Canal Tunnel bypasses the Bourne Bridge rotary & all the Sagamore congestion. What does it do for you? 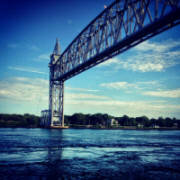 It attracts jealous glances from the non-residents who have to fight the traffic on the two bridges across the Cape Cod Canal. Taking the Cape Cod Canal Tunnel might help you avoid some of the infamous traffic backups this year or create some confusion upon those unaware. Great for cars, travel trailers, boats, motor homes, trucks and motorcycles. These permits are "Valid Until Suspended Or Revoked". 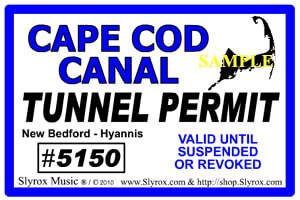 Available Cape Cod Canal Tunnel Permits are the: Red #5150, Red #OU812, Blue #5150, & the Blue #OU812 permits. Please Note: The Cape Cod Canal Tunnel is a fictitious tunnel under the Cape Cod Canal. No such tunnel has been built, nor is it likely to be. The Cape Cod Tunnel Permits are sold on the known premise that there is no tunnel.